Insalata Mista is a mixed salad. It may contain any of the many types of lettuces available in Italy, tomatoes and sometimes small shreds of carrot or cucumber. 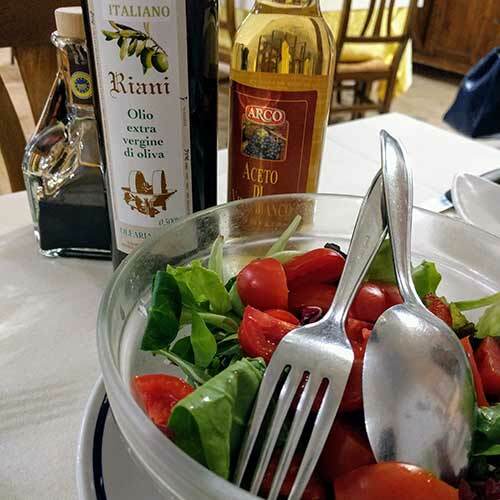 Shown in the picture is the “real” Italian dressing. If you’re used to the gunk with oregano and dehydrated peppers and guar gum they sell in American supermarkets, you may be put off when you see the bottle of olive oil and one or two of vinegar. Just sprinkle the vinegar lightly and drizzle the oil, add some salt and you’re good to go. You won’t miss the sugar in the industrial “fake” Italian dressing I’ll bet. An insalata verde is a green salad that usually contains only green lettuce. In times past the salad was eaten after the main course, but today it’s a contorno, eaten with the meat or fish course.